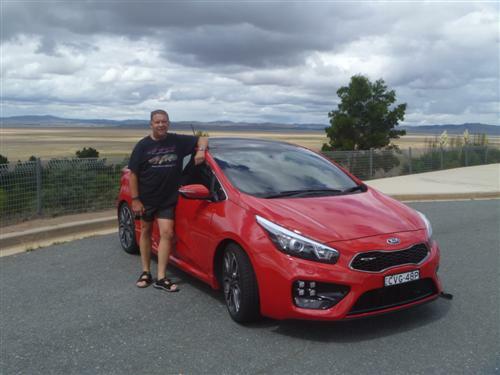 I recently completed a 1,650 km road test of Kia’s sporty competitor to the Toyota 86, Subaru BRZ, Mazda MX5 amongst others. And I have got to say the word impressive springs to mind. The Kia pro_ceed GT with the Tech package retails at just under $36,000* plus ORC (premium paint is optional at $595*). Be assured, you get plenty of car for your money. The 150kW four-cylinder turbo-charged motor thumps out 265Nm of torque from its 1.6 litre capacity. This sees the car accelerate to 100km/h in a respectable 7.6 seconds. During our 1,650 km test the car burned E10 at 7.6 litres per 100ks, about the same as the fuel consumption rating that Kia quotes. The two door coupe looks very purposeful and sporty squatting on its 18 inch wheels shod with 225/40 ZR18 Michelin Pilot Sport 3 tyres. Both my wife and I generally need an air cushion on the seat to relieve lower back pain when driving. This was not the case in the Kia. I would say the Recaro seats are the most comfortable we have ever experienced! The car carries the desirable 5 star ANCAP rating with a wad of high tech active and passive safety aids. The car we tested had a satnav, reversing camera and reversing sensor, rain sensitive wipers and headlights that sensed dusk, auto dimming rear view mirror, LED daytime running lights, just to name a few. A very comprehensive package. The car comes with an industry leading 7 year warranty and 7 year roadside side assist (conditions apply). This lifts the bar to another level when it comes to after sales coverage. What didn't I like – in any new driver driving test you are suppose to look over your shoulder before changing lanes, pulling out from the gutter etc - the body shape of the the modern car makes this a waste of time. You only see an upswept rear of the car. Those dreadful mirrors that show cars a long way away when in fact they are at your rear pillar are dangerous in my opinion. Other than that I couldn't fault the Kia. Although we commenced our trip in Sydney, a highlight was driving from Canberra along the Monaro and Snowy Mountains Highways where the car handled beautifully on both wet and dry roads. Not a hint of understeer or oversteer, it just steered where it was pointed. Ride is firm but comfortable, the brakes are effective with no sign of fade. Strangely, the day I arrived back home I received an e-mail advising me of the announcement of a new four door version of the Pro_cee’d GT. But don’t hold your breath. We won’t see it in Oz for sometime. Release date in Europe isn’t until the fourth quarter of 2015. 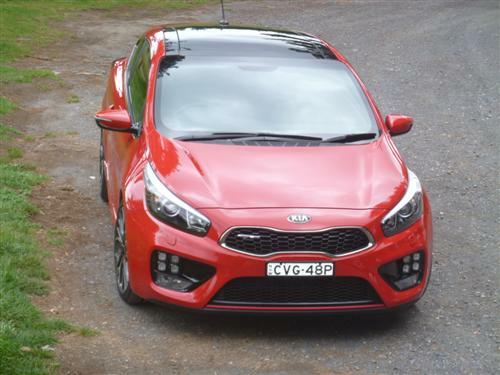 I have got to say that our time in this sporty Kia was most enjoyable. My rating for this fine sports coupe is 8.5 out of 10! 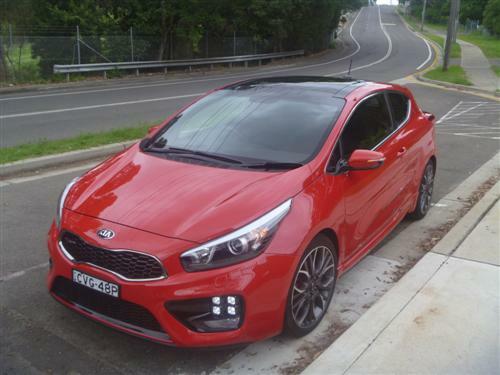 Our Kia Pro_cee'd GT test car was fitted with the Tech package which adds $3,500* to the price of the regular GT with the navigation system. The Tech Pack includes a smart key/ push button starter, active headlamps, exterior door handle lamps, privacy glass, luggage net, power outlet in boot, headlamp washers and sunroof. 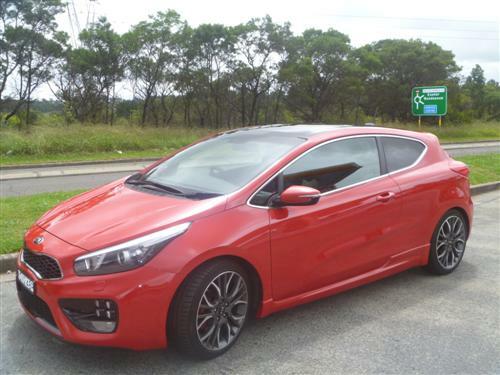 Pro_ceed GT is priced* from $29,990*. Options are navigation for $1,500* and premium paint for $595*. The GT Tech is priced from $34,990* and includes navigation.